After listening to Lexie beg to play soccer for a couple of years, we finally let her play rec soccer and she just wrapped up the first season. 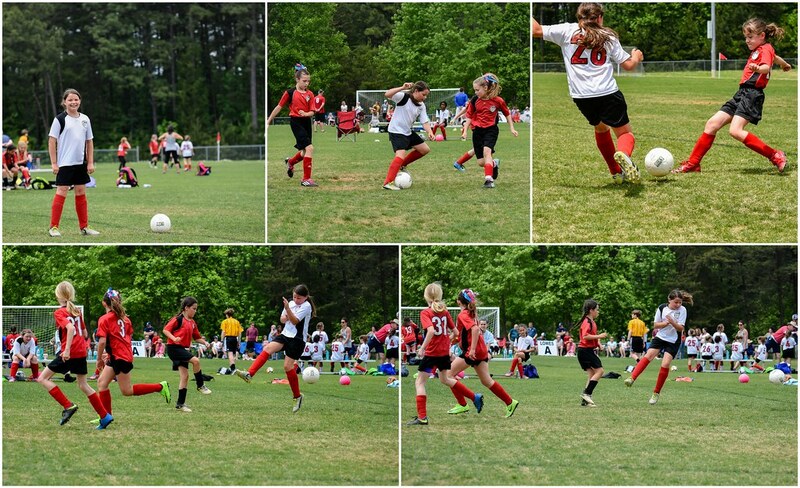 The last weekend of the season is their big tournament so she had a game Friday evening, Saturday morning and Sunday afternoon-- a full weekend of soccer! 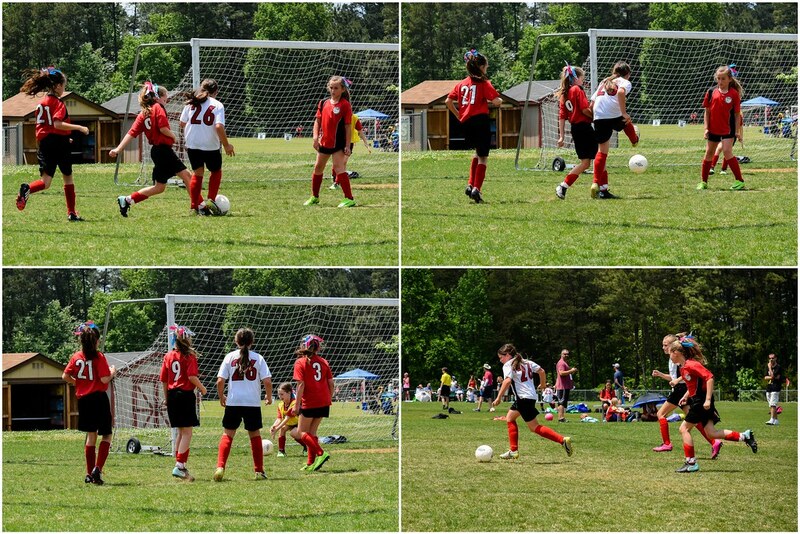 In their last game she started out as goalie and did a great job making sure that the ball never made it into the goal! She moved up to forward (her fave place to be) for the rest of the game. For it being her first season, she's been surprisingly good at footwork-- and isn't afraid to go after the ball. She shoots... she scores again!! And again!!! She had an awesome first season and is looking forward to continuing to play! 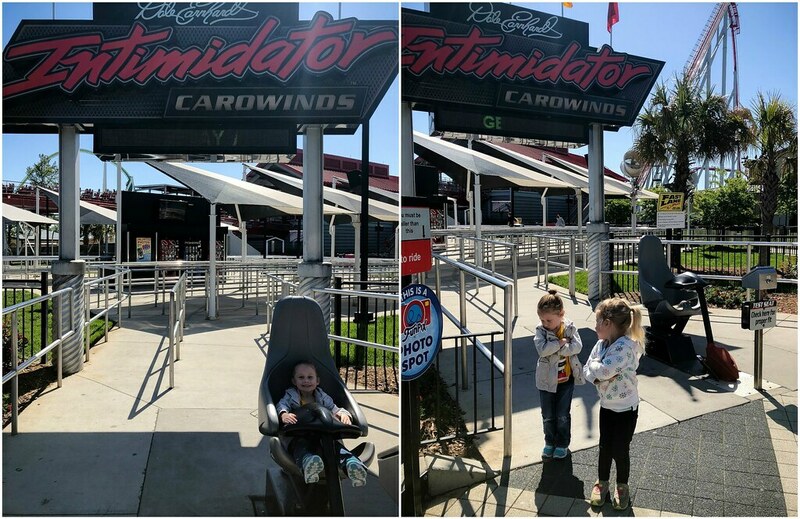 We took Auntie Janne and Hannah to Carowinds for the first time and now even Hannah is a season passholder just like us (ok, fine, it's the free Pre-K Pass, but still, she's a passholder nonetheless!). 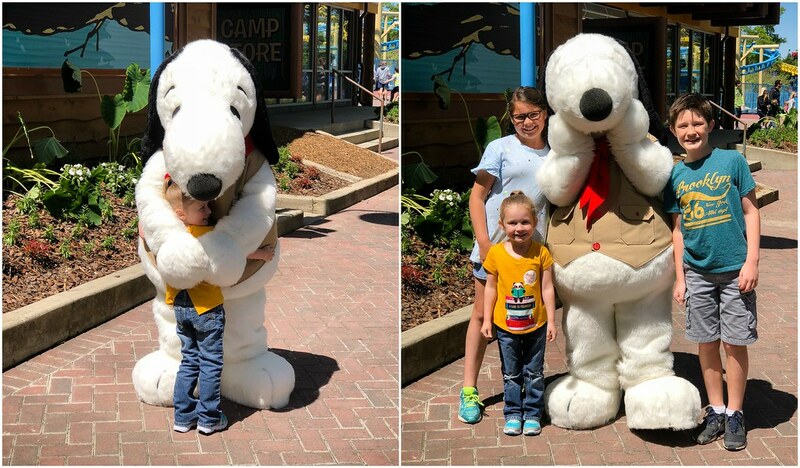 The little girls had to sit out for the first ride of the day and stood around pouting since they were too short. 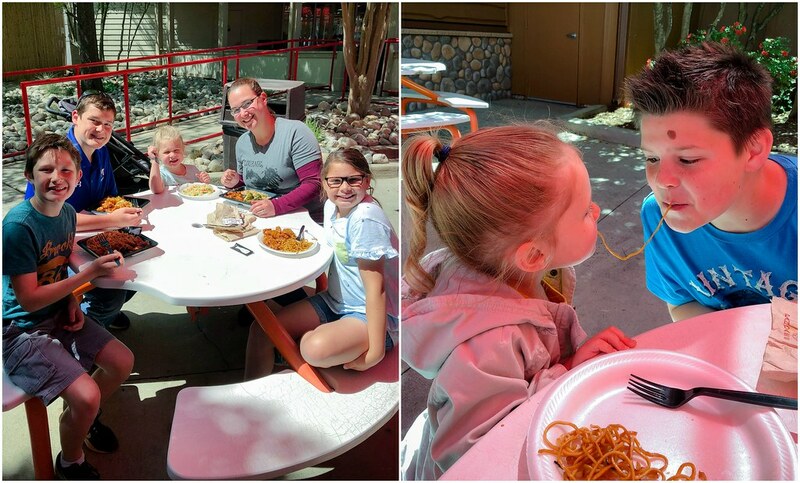 We had our usual Panda Express for lunch... and recreated scenes from "Lady and the Tramp"
So excited to see Snoopy! 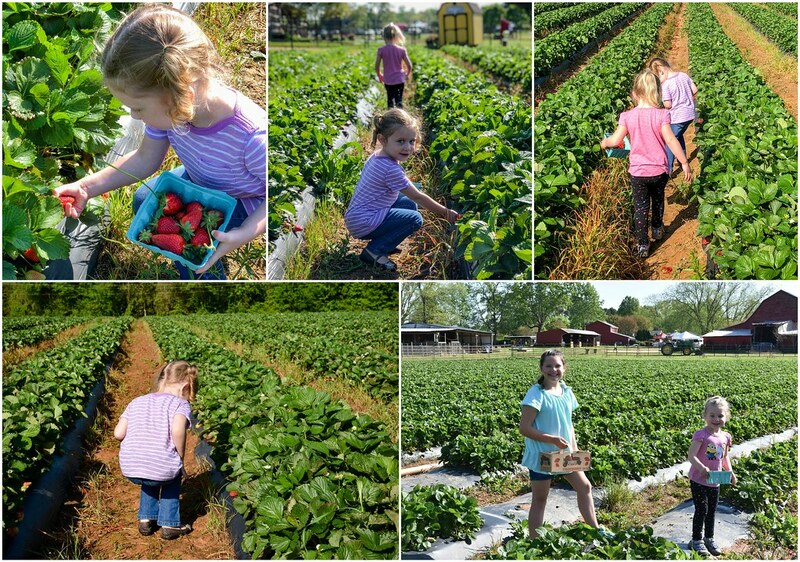 The little girls finally got to go on a ride-- the swings! 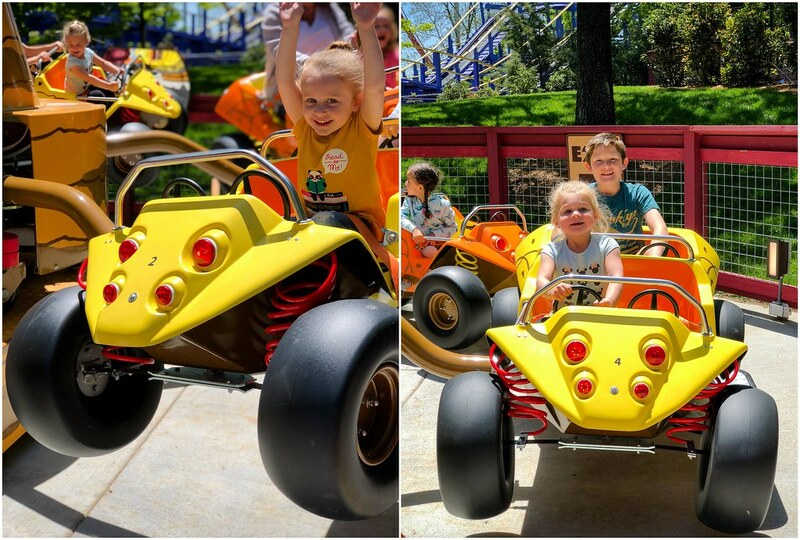 Like our kids, Hannah loved Pig Pen's Mud Buggies! And her first time on a roller coaster was a success!! 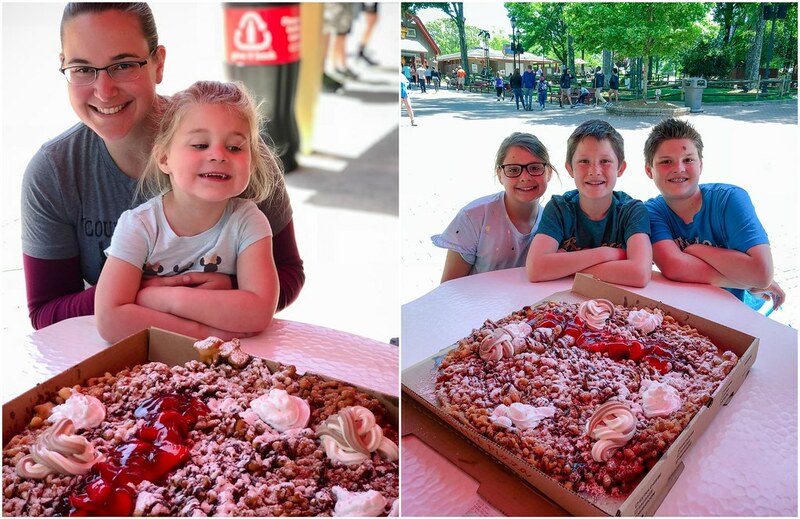 To celebrate Ben's birthday weekend, we ordered the World's Largest Funnel Cake-- and even with two extra people, we STILL couldn't finish it! The little girls fell asleep for awhile and I pushed them around while everyone else went on the big rides. Hannah wanted a picture with Uncle Jacob since their shirts coordinated! 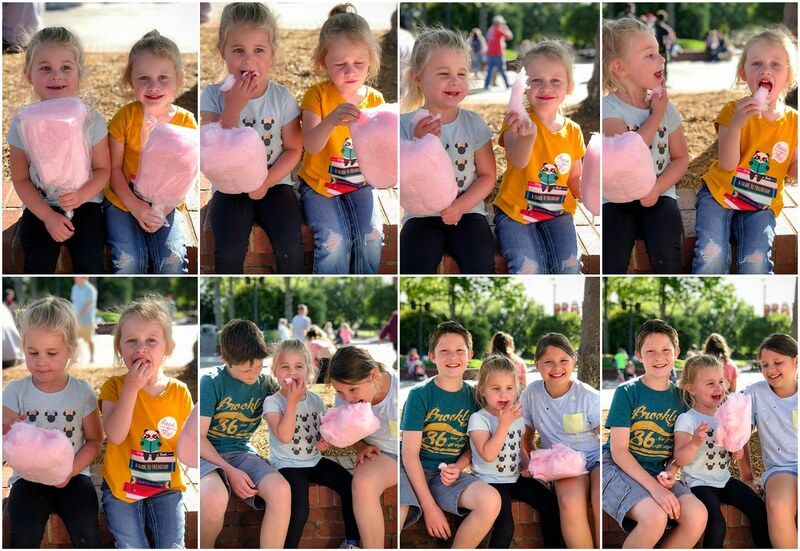 The little girls convinced Dad/Uncle Jacob to buy them cotton candy since they couldn't go on many rides-- he's such a pushover! 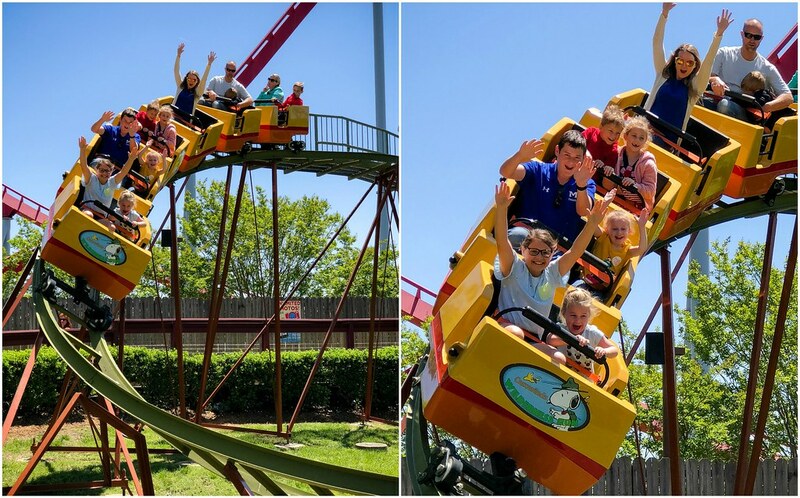 And we wrapped up a fun day at Carowinds with a spin on the horsies! Can't wait until we can take them again! Hannah's favorite thing to do at our house is make cupcakes and it's always the first thing she asks about when she gets here! 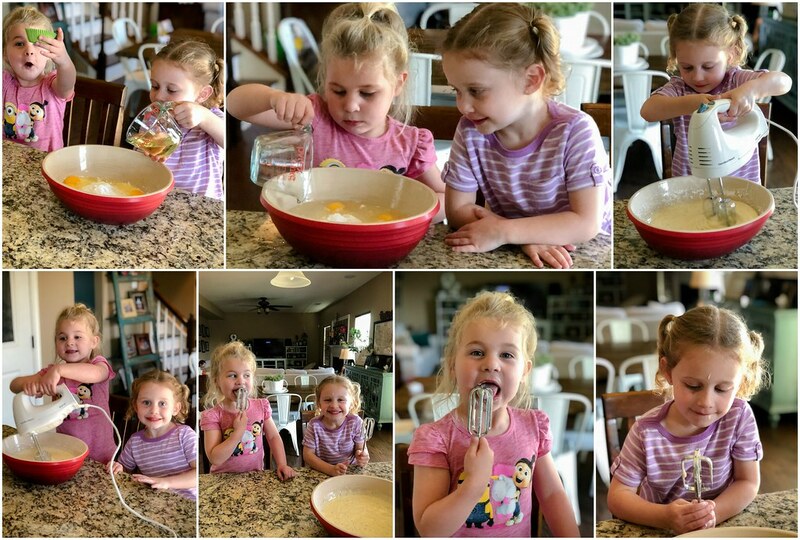 We went to the store and picked out cake mix and frosting and came home and the little girls set to work. I'm sure they'll be making them on their own in no time! 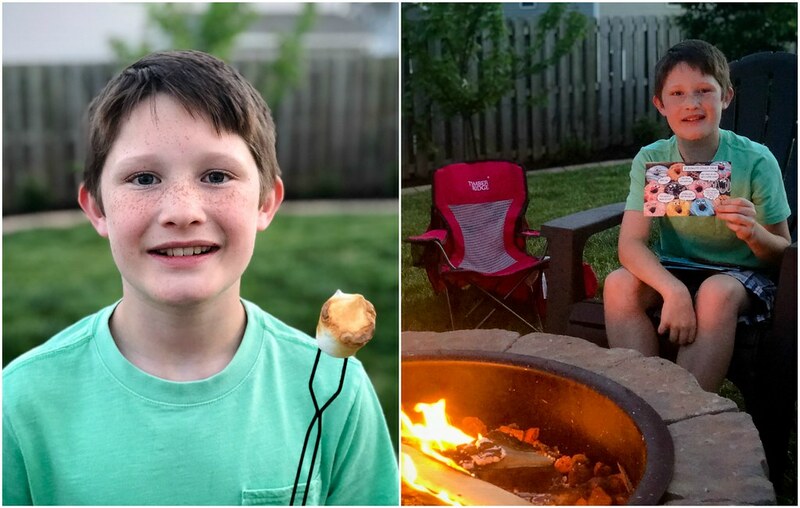 Jacob and the kids built a new firepit in the backyard so we were excited to try it out while Auntie Janne and Hannah were here! ... and s'mores for dessert! And spent the evening celebrating sweet Ben's ELEVENTH birthday!! Auntie Janne and Hannah came to see Lexie play soccer and while I didn't get a single picture of the game, I did get some of the spectators! 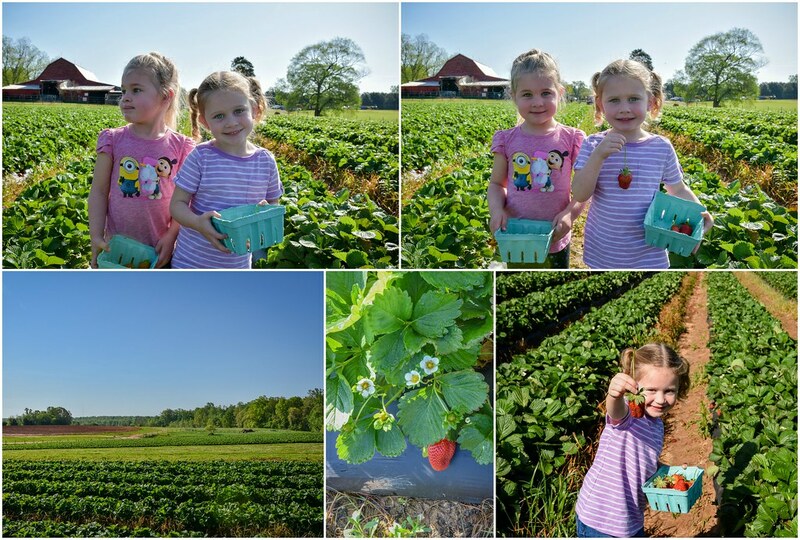 After soccer we went to Patterson Farms to pick strawberries- the girls loved going up and down the rows picking the biggest ones they could find. 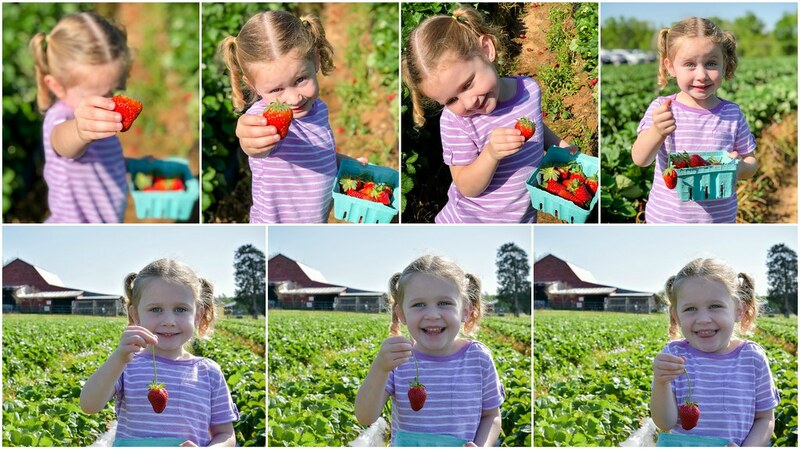 Such a sweet strawberry lover! It was fun being able to share with the experience with Auntie Janne and Hannah. 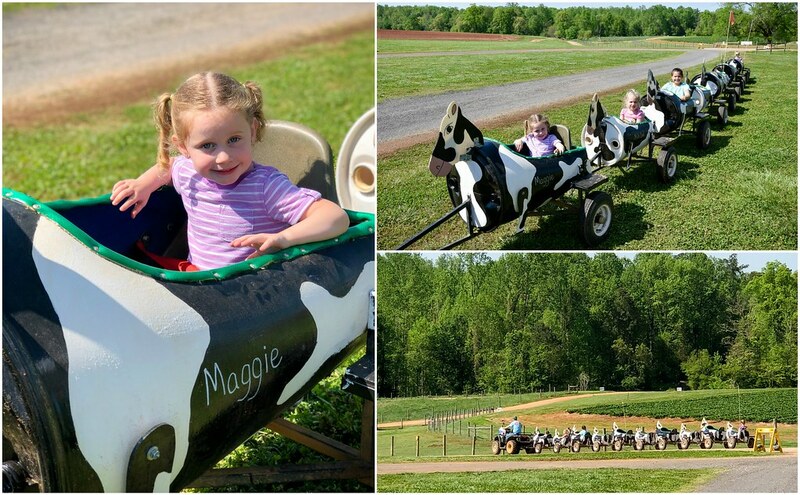 After we picked a couple gallons of strawberries, the girls wanted to ride the cow train. I was impressed at how extensive the train ride was-- they were gone for almost ten minutes!! 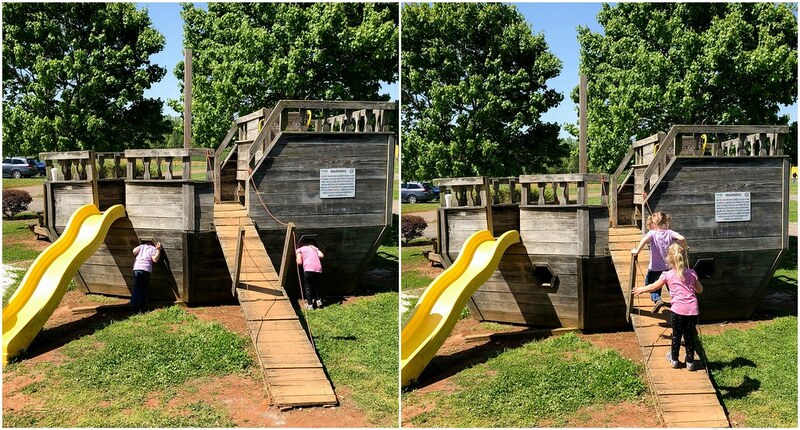 The little girls loved the playground and did NOT want to leave! We went to the Grand Opening of Two Scoops Lake Norman and the kids got a kick out of the two scoop cones! 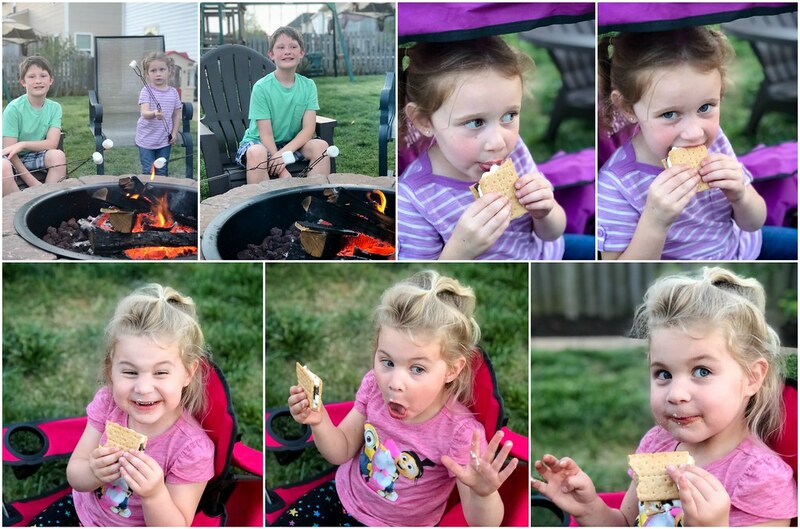 We love having a fire and dinner with our neighbors when the weather is nice! 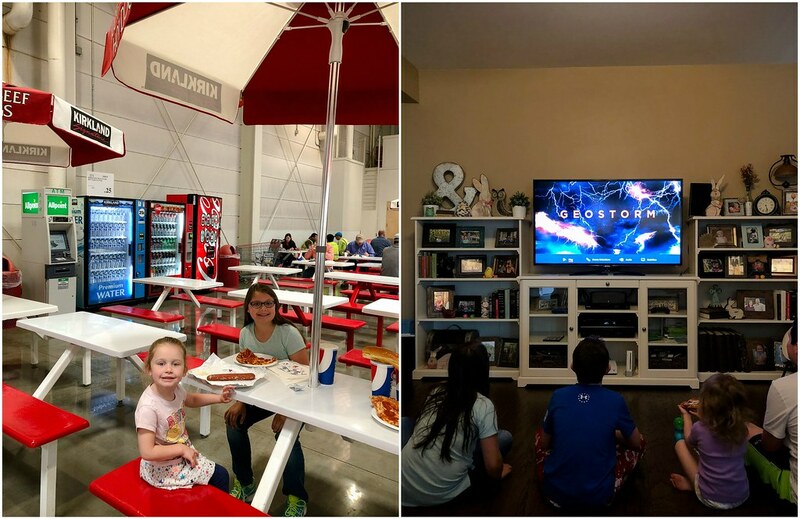 Lunch at Costco and "Geostrom" for pizza and movie night. 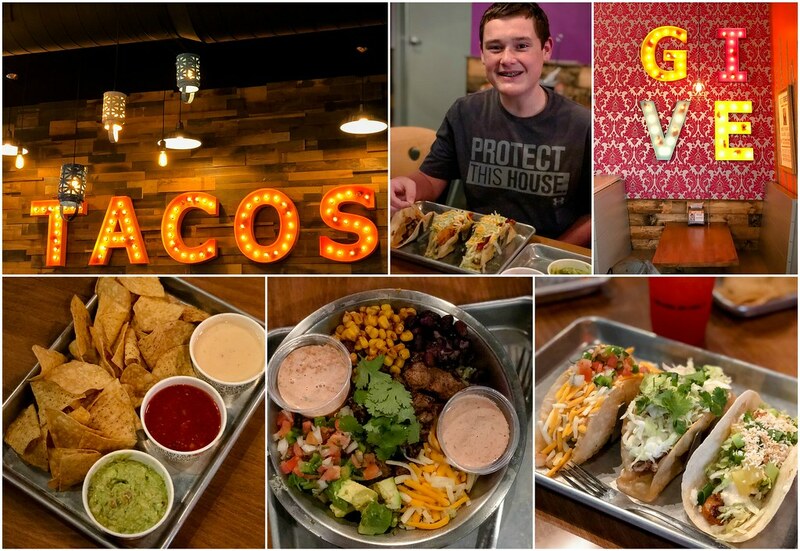 We went to the soft opening at Tacos 4 Life-- officially my new favorite tacos in North Carolina!! Lunch date at Pei Wei-- we were so excited to find one only 30 minutes from our house!! Ninety's is right by Pei Wei so we HAD to stop there after lunch! 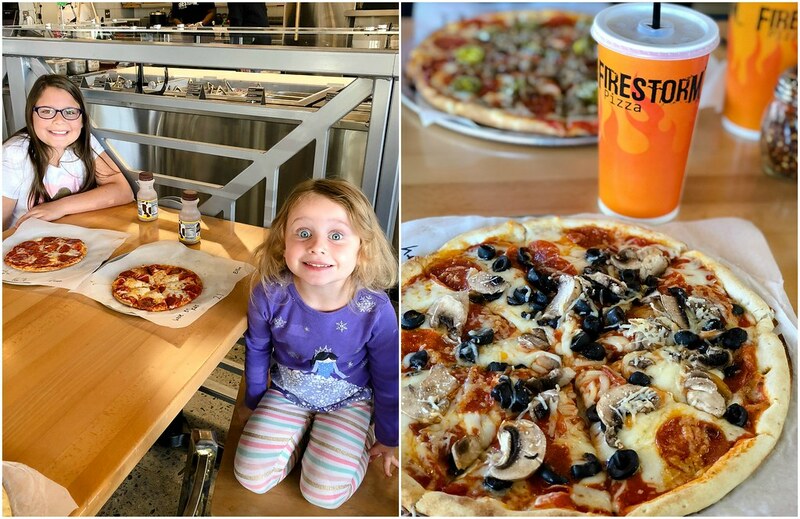 We try and go to lunch once a week to try out new restaurants - it's much cheaper to go when the big kids are all in school! This week's lunch date was at the newly opened Davidson Ice House with a stop at Whit's Frozen Custard afterwards. After we checked out of Shades of Green, we headed to Disney's BoardWalk for the Bon Voyage Adventure Breakfast at Trattoria al Forno. 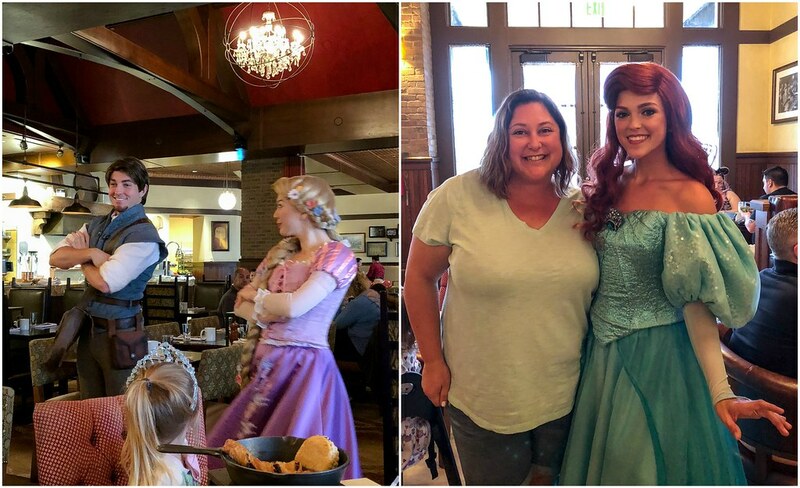 The highlight of breakfast is meeting Rapunzel and Flynn Ryder as well as Ariel and Prince Eric. While they did not come to the table in pairs, they did all make it around and were great fun to talk to while we enjoyed our breakfast! It was the perfect end to a wonderful, whirlwind, girls weekend! 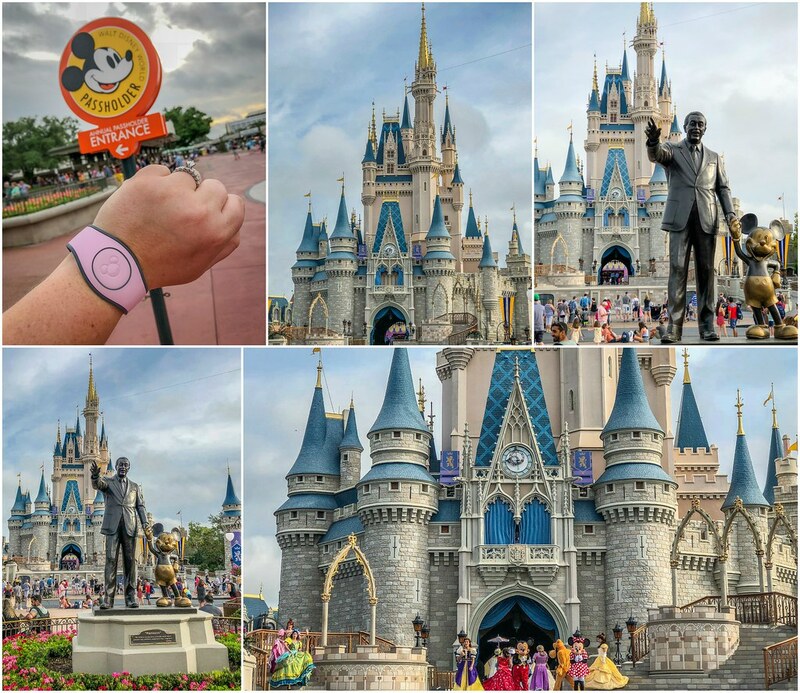 We spent our last day at Magic Kingdom and we arrived bright and early! Even though the park officially opened at 9am, they opened up Main Street at 8am so people could shop or grab a cup of coffee. After using the Passholder line (the little perks make us happy!!) 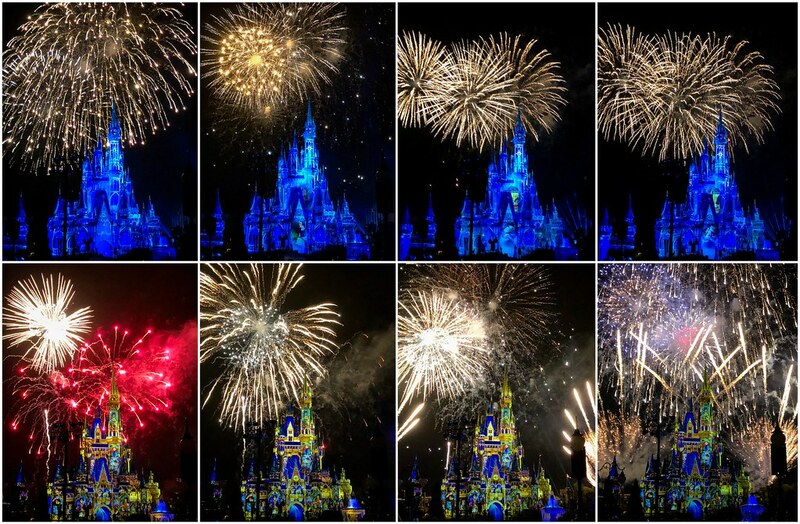 we made our way towards Cinderella Castle to get a spot to watch the Welcome Show. While the weather started out fairly nice, big thunderstorms filled the afternoon forecast. We snagged a great spot on the curb for the 3pm Festival of Fantasy parade and then secretly hoped for the storm to move in and the Rainy Day Cavalcade (also known as the Rainy Day Parade) to take its place. 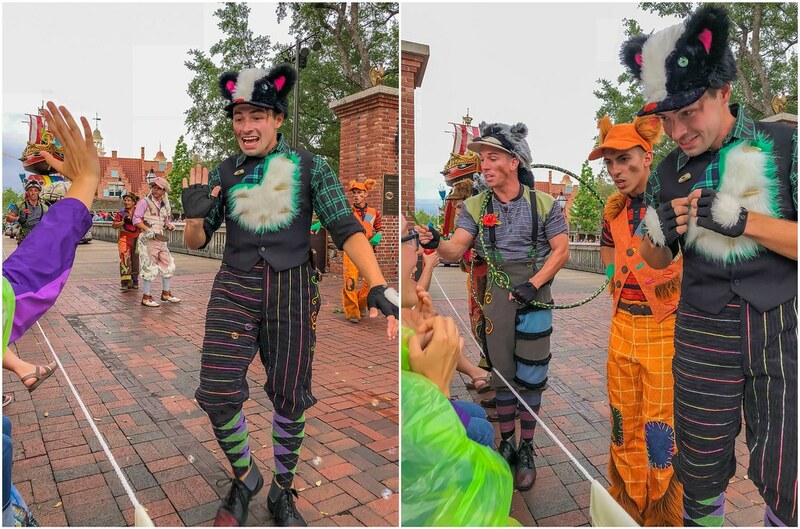 We chatted with the Cast Members as we waited-- they were also hoping for the Rainy Day Parade as none had seen it yet. It sprinkled for about thirty seconds and then started POURING!! We quickly opened up our ponchos, got covered up (some of us had them on backwards at first! ), and held our curb. 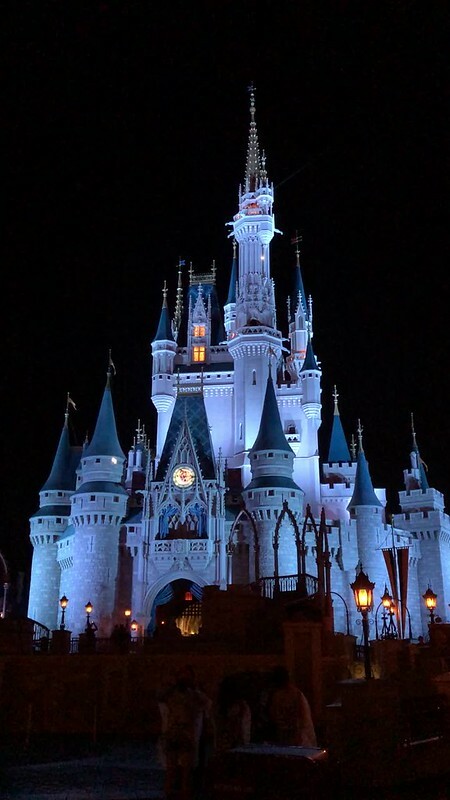 The Cast Members said that we looked like the three fairies (Flora, Fauna, and Merryweather) from Sleeping Beauty and after awhile, we had our own little crowd of CM's to hang out with. Every 15 minutes there was an announcement that due to the storms, Festival of Fantasy would be delayed, and we kept waiting for the announcement switching to the Rainy Day parade. Our fun little group of CM's all chipped in and bought us a Mickey balloon and then offered to take pictures of us (while still holding our curb!) 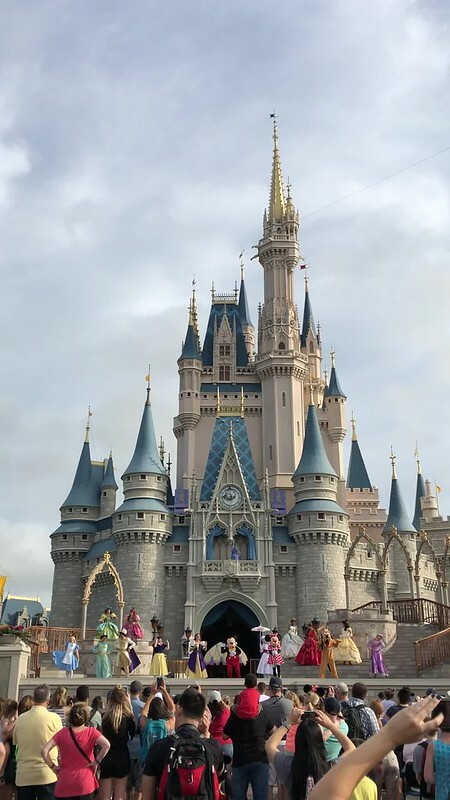 in front of the Castle. 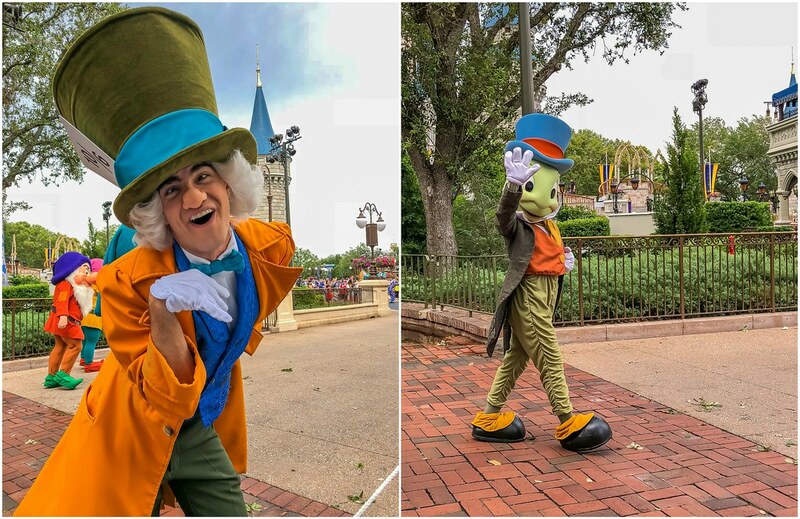 After several delayed parade announcements, and a whole lot of fun and laughing on our part, one of the CM's asked us if we'd like to give up our curb spot and move to the VIP Parade seating on the Liberty Square Bridge and of course, we jumped at the chance! They went and got towels to dry the benches off for us and then we had the most amazing view of the Festival of Fantasy Parade! Because we were in VIP seating, the character interaction was amazing!! Everybody wanted to talk to us and waved and smiled! Under the Sea!! We got high fives from the performers as they passed by. The Lost Boys were particularly enamored with our group! Off to Neverland! Peter Pan and Wendy were so excited that we were wearing matching colors! Prince Charming and Maleficent coming over the bridge. 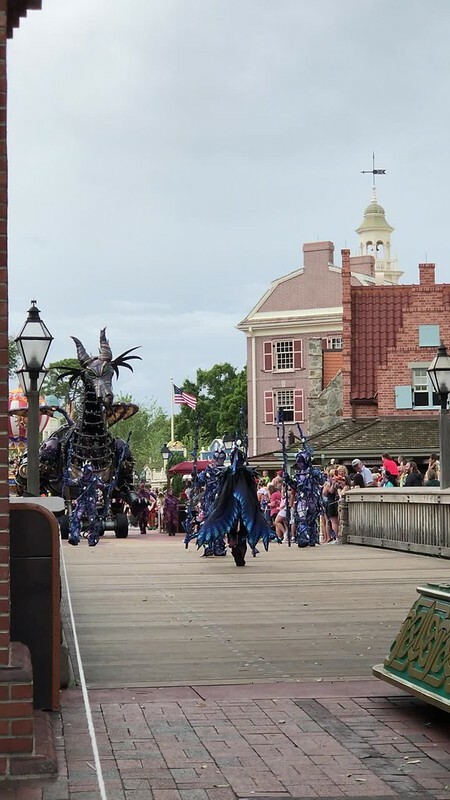 The Maleficent Dragon is one of my absolute favorite parts of the parade! Handshakes and high fives at the end of the parade! 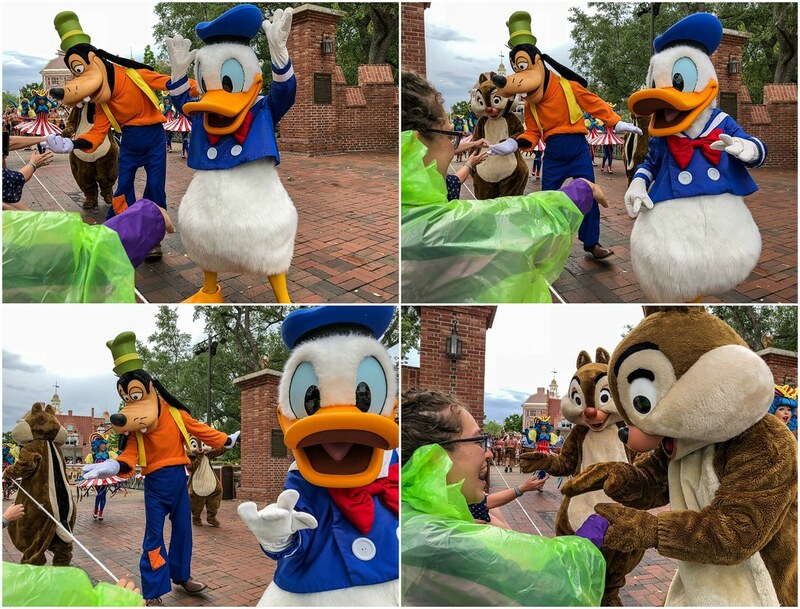 I snapped a few pictures of Abigail with our Mickey balloon before we passed it on to a little kid. We enjoyed a delicious dinner at Skipper Canteen-- another first for all of us and one that we'll all repeat on future trips! 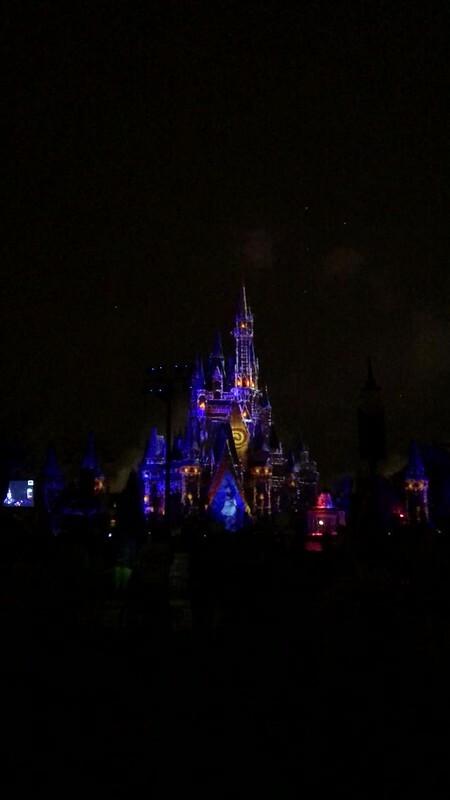 The rain did a great job clearing out the park so we were able to easily get a spot on the hub grass to watch Happily Ever After. 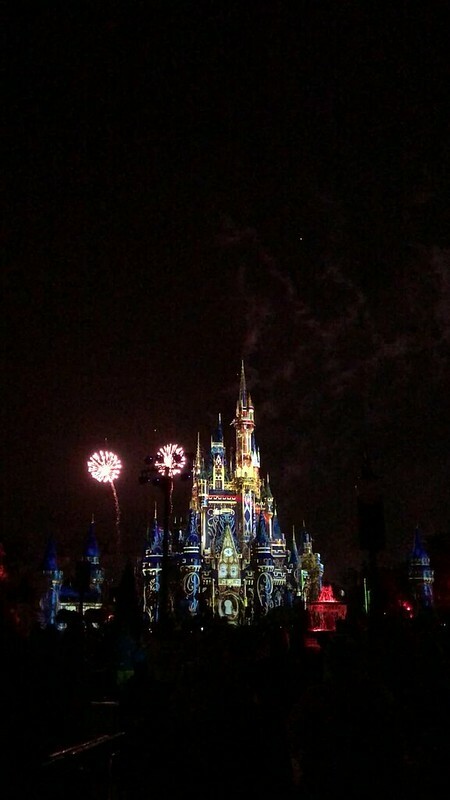 The projections are one of the best parts of this new show! 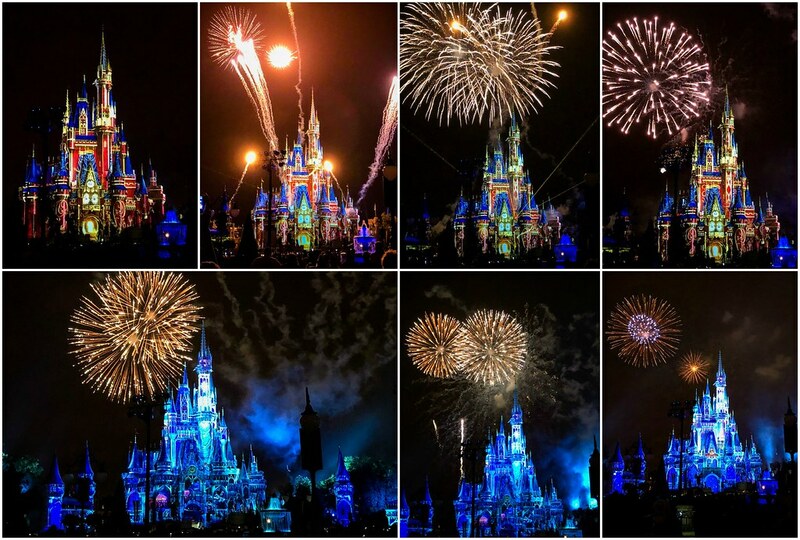 After the fireworks, we headed to Fantasyland and rode Peter Pan, It's a Small World, the Little Mermaid and Seven Dwarfs Mine Train (THREE times!!) in a little less than an hour! 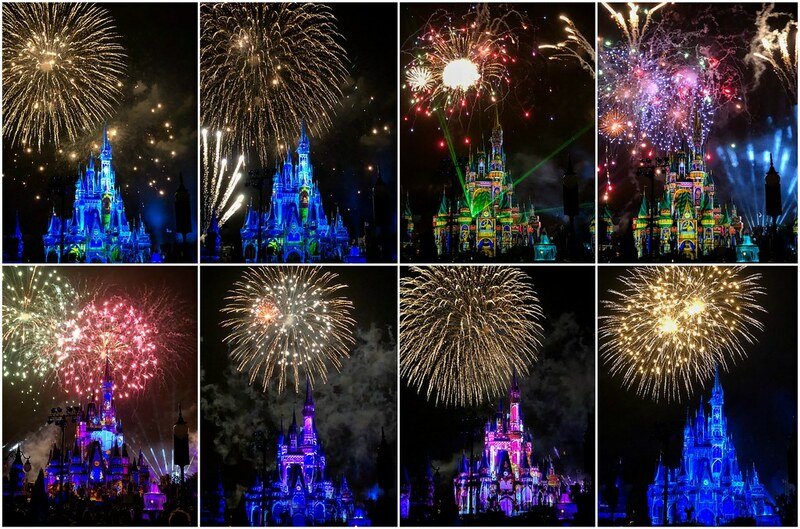 Once the park closed, we slowly made our way to the front after stopping to take pictures of the Castle one last time.